How do I add a facility fee? /Creating, Editing and Managing Events /How do I add a facility fee? While editing your event go to “Ticket Pricing and Options”. Next go to the last ticket type you have and look below that. You will see the “Add Facility Fee” option. 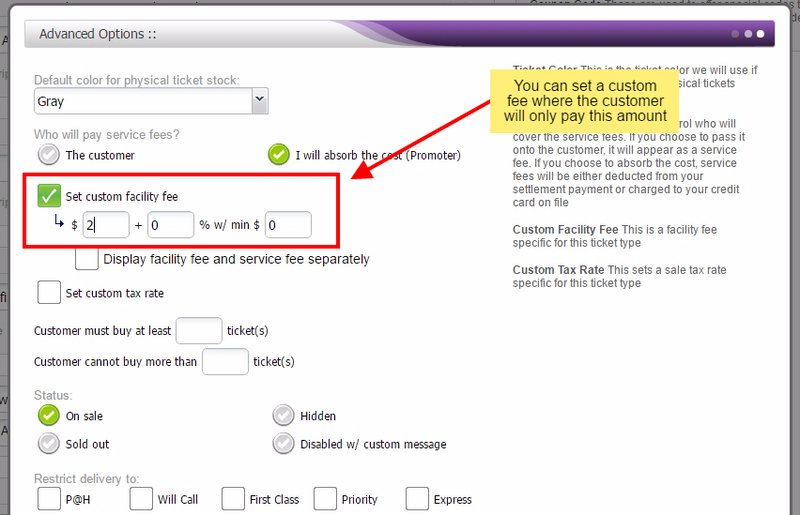 Select that and it will give you the option to set how much of a fee you would like to add on. You will have options to add a percentage, fixed dollar amount, and have a minimum amount as well. By Default this will be included in the service fee but will go directly to you. You also have the option to display this separately. Click on Update Event at the bottom of your Edit page and you are all set! In addition, this can be localized on certain ticket types. You can access similar options by selecting “Options” on each ticket type to edit that particular ticket type.